The annual Armory Art Show took place this past weekend. It’s a big contemporary art fair that the Manhattan galleries look forward to with great anticipation but it’s something that I’ve never attended. Not once! 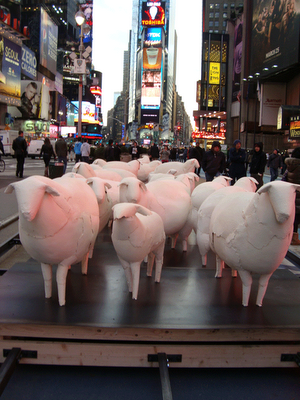 In celebration of the show, Times Square was transformed into a sculpture garden. Here are a few examples. All photos are clickable. Make sure you click on that first one to see the detail. 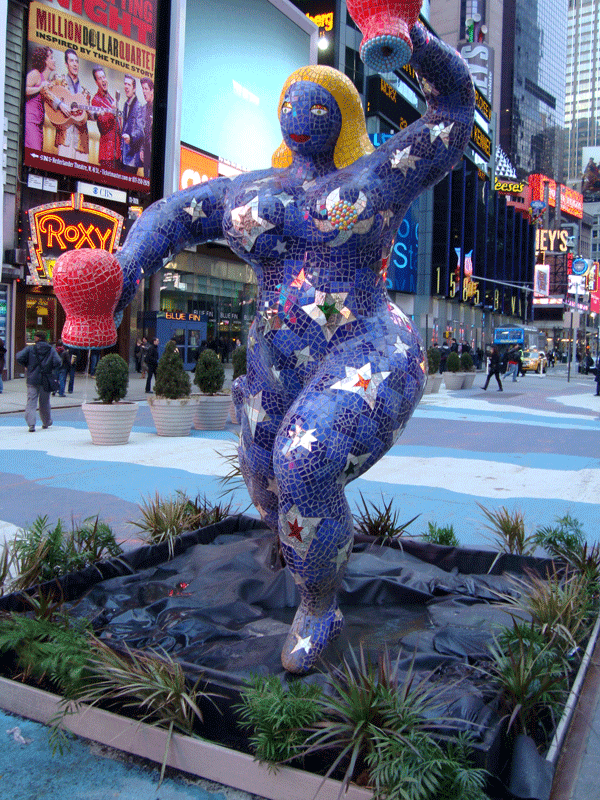 This big boned gal is by Niki de Saint Phalle. You can’t tell but she was kind of sparkly. Water streamed out of those upturned jugs. 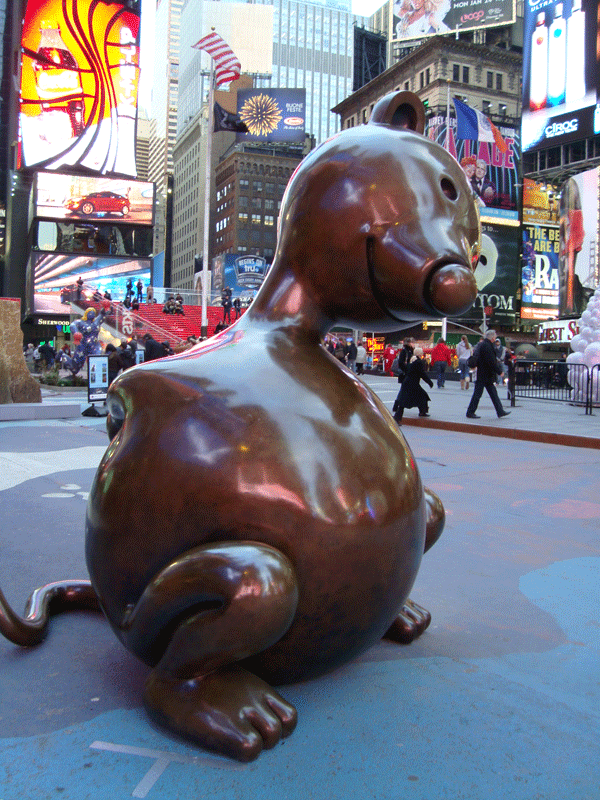 This oversized happy mouse is the work of Tom Otterness. His stuff is so clever. It’s playful. He makes something as hard as steel look soft. He had a wealth of permanent fixtures in Manhattan that include playgrounds, subway stations and a hotel on 42nd Street. I’ve got a bunch of photos of his stuff and have been meaning to do a post. This flock of sheep was grazing right outside the big Marriott. They were hand-made from heavy paper by Brooklyn artist Kyu Seok Oh. I was wondering if the whole flock of sheep/gaggle of tourists thing was an intentional metaphor. I hope not. That would be a bit of an insult. We need our tourists. Without tourists, this town would be about as special as Enid, Oklahoma. i’ve heard about the size of NYC rats, but that fella is HUGE! and yes, it makes me want to touch it. daisy: It’s funny you should mention that. All of his statues are cast with that same deep brown/bronze tone, but there are spots on the public works that have been rubbed gold because people can’t resist reaching out and touching them. tourist or no, most people are sheep. So fun! I wish we had cute rats and sheep here. The closest we come to public art is this. map: Thank you very much. I’m here all week. Don’t forget to tip your waitress.jason: But don’t they seem even more sheep-like when grazing in clusters through Times Square?nimpipi: I think those are great! Do you not like them? Or are you saying that there isn’t enough of it? Scarlet: It *did* rain yesterday! But I haven’t seen the sheep post-storm. Hope they’re not a pulpy mess.Ponita: Are IS silly! Yes, please, post some pics. It’d be a nice diversion from all your stress and entertaining for your readers. “…Water streamed out of those upturned jugs”For one awful moment I returned to the photie, just to make sure it was me who had the warped mind. The jugs got my too. Only just noticed them. Jimmy: I was wondering how long it would take for someone to go there. Less than 24 hours!nurse: Wait until you see his other stuff. He’s great!Pat: I think you can get a blue blow-up gal with jugs at specialty stores. Now I’m curious about Enid, Oklahoma. How do you do that? The sheep are splendid. I don’t suppose there was any intention on the artist’s part to mock tourists, but maybe our general tendency as a whole to become a bit sheeplike in a crowd, tourist or not.What a lot of catching up I have to do here. I will come back and read a bit more after doing a little work, but the temptation to keep scrolling down is killing me! kykn: Enid is my go-to metaphor for the middle of nowhere. Eryl: Come back anytime. I run a 24-hour, 365 days a week shop here. I’ve always wondered at the irony that both birds and sheep flock. And yet are so very different. and I like the sparkley lady. lord….leave poor enid, oklahoma alone or beware…it a bastion of red neck christian beer drinkin’ good ole boys and gals!